It allows to launch different java programs inside the same VM. The VM will always be alive, so no more startup overhead and less memory used. This way it is possible for programs, even written in languages different from java, to access "services" exposed by the engine. It has been built with a pluggable architecture in mind, so that it is possible to develop new "services" for the engine. It is run as a service, so that its "services" will always be available for other programs. Please take a look at the Overview and Tutorial sections for details. Release 1.0 of "Java Desktop Engine" is now available. Click here (800KB) to download. Source code for this version will be available soon. Release 0.8 of "Java Desktop Engine" is also available. Click here (940KB) to download. Source code is now available. Click here (820KB) to download. For those of us who make heavy use of java tools it's always been quite frustrating to have to open lots of resource eager VMs just to launch very useful but simple programs. Moreover, VM starting for simple utilities is a real waste of time. We've all appreciated the difference when launching a compilation from inside an IDE. In this case javac is launched as a process inside an already active VM, and the difference is evident. JDE in the beginning was born to try to address these problems. Having an always active VM where it is possible to launch processes in, means faster process start and less resources used. A lot of time is saved by from not loading again and again the VM. There's nothing new in this. Some very good related projects are alive and kicking on the net, some of them focusing on a complete Java desktop enviroment, some on just a shared VM. JDE positions itself a bit differently, as it can be seen as a java engine exposing pluggable services (shared VM being just one of these). 1) Shared System statics. System.in, System.out,System.err are shared inside the VM. Yes, we could define a different set of System statics for each process running inside our VM, but this will imply modifying the code of the application to make it "compatible" with JDE. There's just one GUI event queue per VM, so for example, an active modal dialog in whatever process will be modal for the entire VM GUI. Obviously, this approach breaks the VM sandbox. There are some different solutions to address this problem, all of them being partial though. Anyway, depending on the use we'd like to do of JDE, this could or couldn't be a problem. The entrypoint of JDE is an XML-RPC server accepting calls for services. Everything needed from JDE can be obtained by making a call to it. The main service exposed by JDE is obviously the java process launching one. By making a call, it is possible to launch a java process insisde the VM. Having an XML-RPC server allows us to use any language with xmlrpc capabilities to launch java programs. The package includes a simple python script, that can be easily used as launcher (see our simple tutorial for details). Included is also a "Manager", a simple swing application with active process listing and process launching capabilities. Hopefully, this one will evolve as far as there will be more services in JDE to be the reference manager for the engine. 1) Java process Launcher. The one this project was started for. You can launch java processes inside the living VM. 2) Scripting engine. Via a simple xmlrpc call you can launch a script on the engine and get back results. The nice thing, as usual, is that being xmlrpc based, you can use it as a service called by anything written in any language. Currently supported scripting language is BeanShell. More will be available soon via BSF. 3) Fast editor Based on jEdit Syntax Package 2.2.1, a simple, fast and useful editor with only some of the nice features jEdit has got us used to. I'm currenlty making daily use of JDE and, though in beta stage, it seems quite stable. 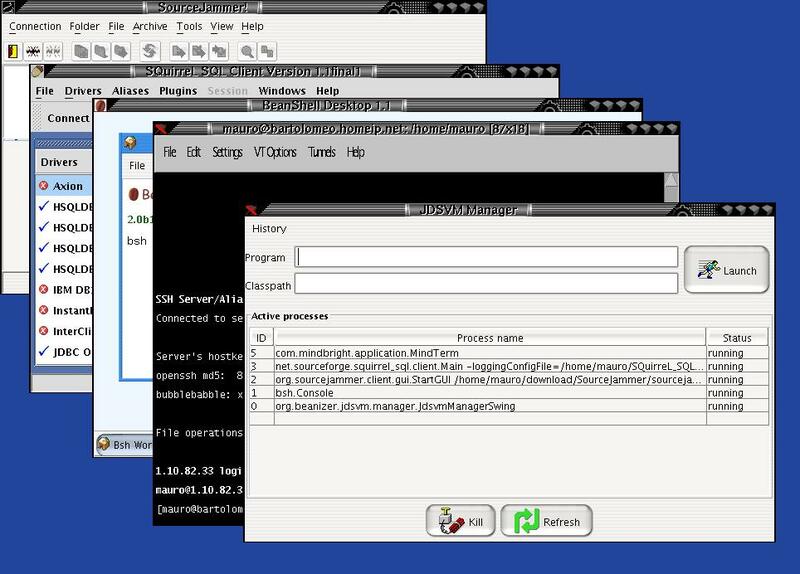 This is a shot of some programs together with the JDE manager running inside a single virtual machine. Just to give you a rough idea, the entire VM (shared VM + manager + all the programs) on a Mandrake Linux, kernel 2.6.0-1, J2sdk1.4.2 with no special VM options takes 46MB. On the same configuration, the same programs launched on single VMs take more than 3 times the memory. What's missing Basically, tons of things. JDE is currently not focused on security. This needs to be addressed ASAP. I'm not sure future releases will be based on Echidna, as other frameworks are being tested. I'm also trying to find a solution for the GUI (single) event queue problem, and honestly I'm not sure it can be solved on current VMs. Lots of plugins/scripts needs to be implemented; some are being developed just now and some are to come as the project goes on. Better arguments parsing by the launching scripts and also different programming languages (currently included scripts are in Python) are being prepared. JDE has only been tested on Linux, but it doesn't make use of anything but standard java features, so I'm quite confident it runs on other platforms too. Well, I'll write down a real tutorial if enough interest arises on the project. For now, just consider it as a kind of "what you can do with this release" document. Basically, core functionalities are already active. You can run processes or scripts inside one VM , you have a manager application to launch/kill them, some python scripts to make xml-rpc calls to the engine and a few other things. The engine works, and depending on the kind of application you launch inside of it, it's quite stable. 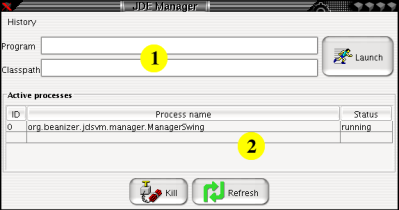 1) GUIManager ,will also launch the Jde manager graphical application. 2) -LnF <look'n feel> ,being <look'n feel> the main class of a look'n feel implementation and provided that the corresponding jar file is in "lib", will launch the engine with the specified look'n feel. Ok, you've launched the engine, and now? launchScript <scriptname> will launch "scriptname". I.E. : launching "jde getScriptList", you'll get a list of installed scripts. One of them is "Editor.bsh". To launch it just type "jde launchScript Editor.sh". That's it. "jde" and jva" scripts are just examples of how simple it is to interface with the engine using languages different from Java. Virtually any language with xml-rpc support is able to interact with JDE painlessly. is not important,as used classes have already been loaded). The "1" section of the screen allows to launch processes, just like "jda" script. Section "2" keeps a list of active processes and allows to kill them. Just select one process and click "Kill". The list gets updated automatically when processes are launched/killed. "Refresh" just does what it says.